Donald Davis was born in a Southern Appalachian mountain world rich in stories. “I didn’t learn stories, I just absorbed them,” he says as he recounts tales and more tales learned from a family of traditional storytellers who have lived on the same Western North Carolina land since 1781. Davis grew up hearing gentle fairy tales, simple and silly Jack tales, scary mountain lore, ancient Welsh and Scottish folktales, and-most importantly-nourishing true-to-life stories of his own neighbors and kin. It was Uncle Frank, a man who “talked in stories,” who helped Donald capture the real and daily adventures of life…and it was Uncle Frank who gave him the creative courage to tell about them. Davis remembers, “I discovered that in a story I could safely dream any dream, hope any hope, go anywhere I pleased, fight any foe, win or lose, live or die. My stories created a safe experimental learning place. And that is the way that Donald Davis has approached all of his learning places… as a student at Davidson Collage; as a graduate of Duke University Divinity School; as a retired Methodist minister; as former Chairperson of the Board of Directors for the National Storytelling Association; as featured teller at the Smithsonian Institution, the World’s Fair, festivals and concerts throughout the United States and the world; as prolific author and producer of books and tapes of his works; as master teacher of workshops and storytelling courses; as a guest host for the National Public Radio Program “Good Evening”; and as father of four sons. 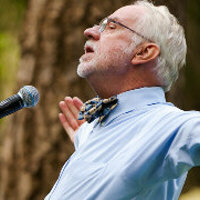 Hear Donald at the PowellsWood Storytelling Festival July 26-27!